Last night Stuart and I went to see Dame Maggie Smith star in Christopher Hampton’s one-person play A German Life at the Bridge Theatre in London's glitzy London Bridge Quarter. This new solo show marks Smith’s first stage role in 12 years. Moreover, it is a corker. A German Life started its own life as a filmed documentary. In 2016 directors Olaf S. Müller, Roland Schrotthofer, Florian Weigensamer, and Christian Krönes took it upon themselves to film controversial figure Brunhilde Pomsel, then aged 105, a year before her death. Brunhilde described her occupation in that film as, "stenographer and typist, secretary, and broadcaster." But, she was more than that. Very much more. "I was just a side-line figure and not at all interested in politics." Maybe true, but she nevertheless got closer to one of the worst criminals in world history than anyone else then alive. For Pomsel used to work as a secretary, stenographer, and typist for the Nazi Propaganda Minister Joseph Goebbels. 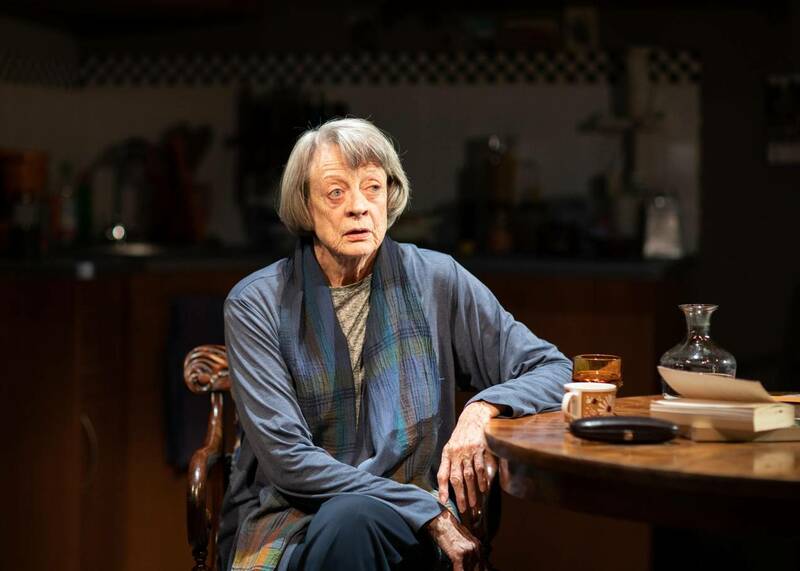 Maggie Smith's performance, Christopher Hampton’s play, and Jonathan Kent's production are all sublime. For each draws you in. Quite literally in the case of the production. As Dame Maggie sits at her table, a pair of glasses in hand, both she and they creep imperceptibly towards the front of the stage. It’s a clever trick. Born in Berlin in 1911, we hear of a difficult childhood, an abuse father, and a clutch of younger brothers. Pomsel was bright though and initially worked as a stenographer for a Jewish lawyer and as a typist for a rightist nationalist. She gleefully admitted, "I worked for a Jew in the mornings and a Nazi in the afternoons!" In 1933, she gained a job as a secretary in the news department of the Third Reich's broadcasting station after joining the Nazi Party. On the recommendation of a friend, she was transferred to the Reich Ministry of Public Enlightenment and Propaganda in 1942, where she worked under Joseph Goebbels as a shorthand writer until the end of the war. Pomsel's tasks included "massaging downwards statistics about fallen soldiers, as well as exaggerating the number of rapes of German women by the Red Army". She seemed almost proud of the fact. After the fall of Berlin in 1945, Pomsel was imprisoned by the Soviet NKVD until 1950 in three different concentration camps, Buchenwald, Hohenschönhausen and Sachsenhausen. She then returned to work for the state broadcaster. "I know no one ever believes us nowadays – everyone thinks we knew everything," she said of the Nazis’ regime. "We knew nothing, it was all kept well secret." And we so want to believe her. But we don't. Smith is on top form. We learn to admire Pomsel if not actually like her. But as we learn of her defiance at refusing to feel any guilt over the Holocaust we find her both appalling and galling. "Why should I feel guilty?” she states matter-of-factly, “Germany was such a happy place. We didn't know what was going on. Would you have behaved any differently in my place?" And that of course is the nub of the play. The thing that brings us right up to date. Are we ignoring terrible things being done in our name today? Do we listen to the rhetoric, hear the hot air, and believe at least some part of the lies we are all being fed? Does some part of us fear the ‘different’, the 'other', the 'vermin', and the 'sub-human'. It is a sobering thought to think that we could all so easily be "Pomsel." Shortly before her death, Pomsel revealed that she had been in love with a man named Gottfried Kirchbach, who had a Jewish mother. They planned to leave Germany together. In 1936 Kirchbach escaped to Amsterdam to arrange a new life. Pomsel visited him regularly until he told her she was endangering her life by doing so. She aborted their child after a doctor advised her the pregnancy might kill her because she had a serious lung complaint. It is a bitter coda to a fascinating life. And it is a life Smith brought so beautifully alive. Go see.